Kathryn Bernardo and Daniel Padilla topbill the movie version of She's Dating the Gangster, which is based on a young adult novel published by Summit Books. The fourth Daniel Padilla-Kathryn Bernardo movie has reportedly earned P80 million in the box-office, according to Star Cinema. She’s Dating The Gangster grossed this amount in the box-office last Saturday, July 19, despite the inclement weather brought about by typhoon Glenda recently. Last Sunday, July 20, Star Cinema announced that the box-office figures breached the P100 million mark. Daniel and Kathryn previously worked on the movies 24/7 in Love (2012), Must Be Love (2013) and Pagpag: Siyam na Buhay (2013). SDTG, based on a young adult novel with the same title published by Summit Books, stars Daniel and Kathryn as "pretend couple" Kenji and Athena who end up falling for each other. This Star Cinema movie held its premiere night last July 15 and it opened in cinemas nationwide last July 16. In his Twitter account, Star Cinema's ad and promo director Roxy Liquigan posted earlier tonight, July 19: "Hello P80million, is that you? :):):) #ICANTBREATH"
The hashtag refers to a kilig line in the movie between the characters of Kathniel. In a follow-up tweet, Roxy posted: "Let's go for P100m tomorrow!!! 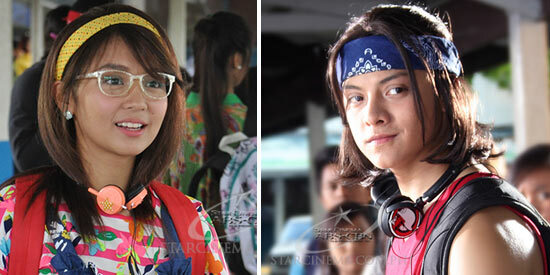 #ICANTBREATH #KDNumberONE"
SDTG director Cathy Garcia-Molina revealed that they did a lot of changes to the story that was originally written by Bianca Bernardino in 2005. This 2014, the movie's screenplay was written by Carmi Raymundo. During the premiere night, three cinemas reserved for the red-carpet screening were jampacked with fans of the tandem dubbed as Teen King and Queen. Last July 17, Star Cinema’s advertising and promotions manager, Mico Del Rosario, posted on his Instagram account: "P15 Million yesterday alone! Maraming maraming maraming salamat po!!! Love, , #teamgangster #shesdatingthegangster"